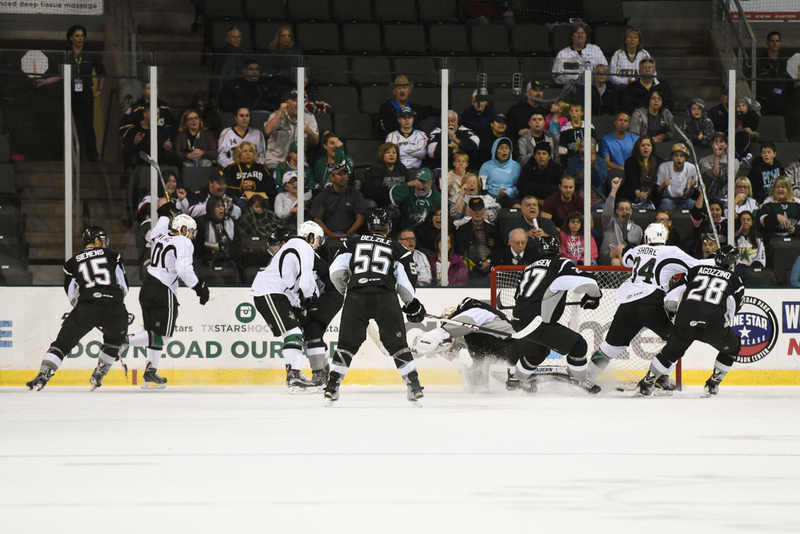 The Texas Stars had a pre-season rematch against the San Antonio Rampage at Cedar Park Center last night. It was another frenzied game against the league rivals. The Stars trailed behind the Rampage until late in the 3rd period when a goal by Justin Dowling tied the game to force an overtime period. The first shot is a battle for the puck as Jessie Blacker tries to get possession in the Stars' end. The 2nd shot is Dowling and Shore celebrating as the game tying goal slips in the Rampage net. The puck is visible in the flurry of ice spray. Julius Honka gets the 3rd shot with his game winning overtime goal off of a pass from Dowling. Honka was chosen as the 1st Star of the Game.